A heartwarming new photograph of the Duchess of Cambridge cradling Prince Louis after his christening was released by Kensington Palace today. 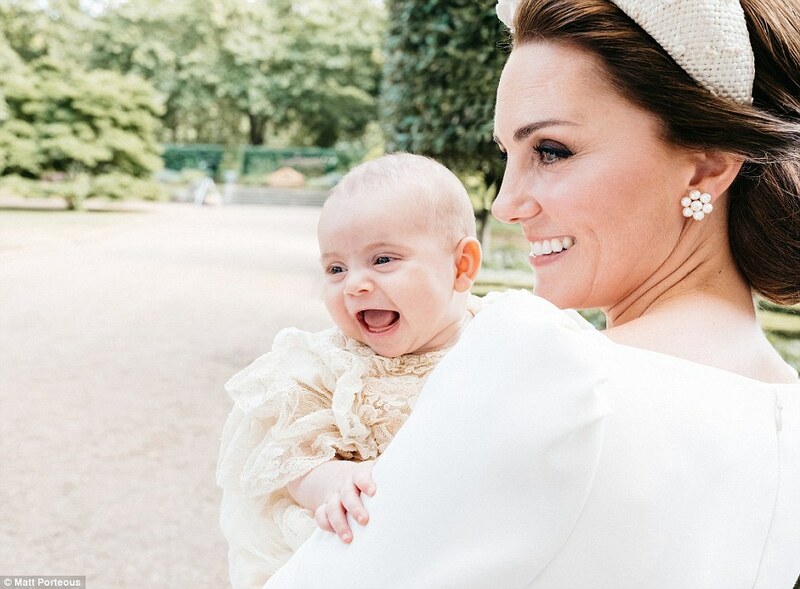 Louis, 12 weeks old today, slept through the entire ceremony but was pictured alert and with a wide opened-mouth smile as he was held upright by his mother in the gardens of Clarence House. The new picture taken by Matt Porteous was released on social media at 10am today, nearly 12 hours after Kensington Palace put out another four shots by Matt Holyoak from the day last night. Louis was wearing a replica of the royal christening robe, made of fine Honiton lace lined with white satin, which was created in 1841 for Queen Victoria’s eldest daughter, Victoria, the Princess Royal. But by 2008 it was clear the gown was becoming delicate and the Queen’s senior dresser Angela Kelly ran up a hand-made replica in order to preserve the original. It’s the first time we’ve seen the Cambridges together as a family of five, and of course the Duchess looked as sophisticated as ever to celebrate the christening of little Prince Louis. She wore cream outfits by Alexander McQueen to both George and Charlotte’s christenings, so it was no surprise that she turned to her wedding dress designer again on this occasion. We love the V-neckline on this bespoke dress, which features little puff sleeves that are rather reminiscent of the McQueen design Kate wore for Trooping the Colour earlier this year. When teamed with a hat by Jane Taylor, she looked absolutely radiant. It’s not available to buy since it was made just for Kate, but click (right) to shop the current McQueen collection at NET-A-PORTER, or add some white to your wardrobe with the help of our edit below. Who is Prince Louis’s photographer Matt Porteous? Kate wore a cream Alexander McQueen dress with floral headpiece by Jane Taylor, and her long hair was swept back in a bun. The latest photograph of Louis and his mother released by Kensington Palace was taken by Mr Porteous, who also took Prince George’s third birthday portrait. He was asked by William and Kate to take some private shots for their personal family album, in addition to the ‘historic’ formal portraits captured by official photographer Mr Holyoak. But aides said the couple loved this particular picture so much that they decided to release it to the public today. 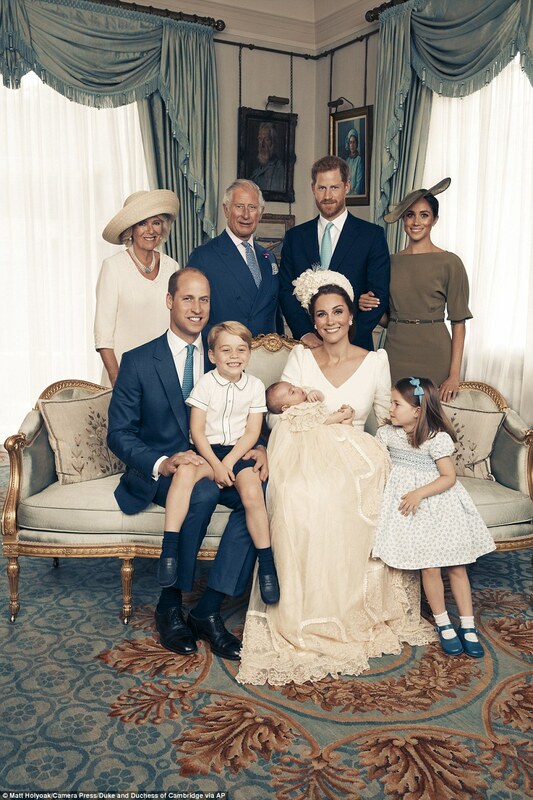 A statement released by Kensington Palace said: ‘The Duke and Duchess of Cambridge have released an additional photograph taken at the christening of Prince Louis on Monday,July 9. ‘The photograph was taken by Matt Porteous in the garden at Clarence House, following Prince Louis’s baptism at the Chapel Royal, St. James’s Palace. 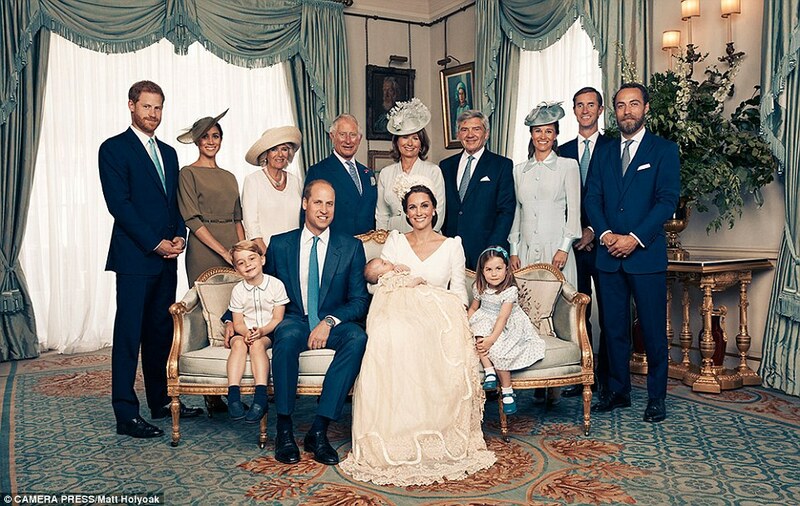 Prince Louis may have been the star of the show, but it was his mother’s family that took centre stage for this happy portrait after his christening. In fact there were more Middletons present than HRHs as guests of the Duke and Duchess of Cambridge. Louis was christened in the Chapel Royal at St James’s Palace last Monday, before the families then reassembled at nearby Clarence House. And with the Queen and Prince Philip absent, it is Kate’s family who dominate in this image, one of four taken by photographer Matt Holyoak and released today by Kensington Palace. 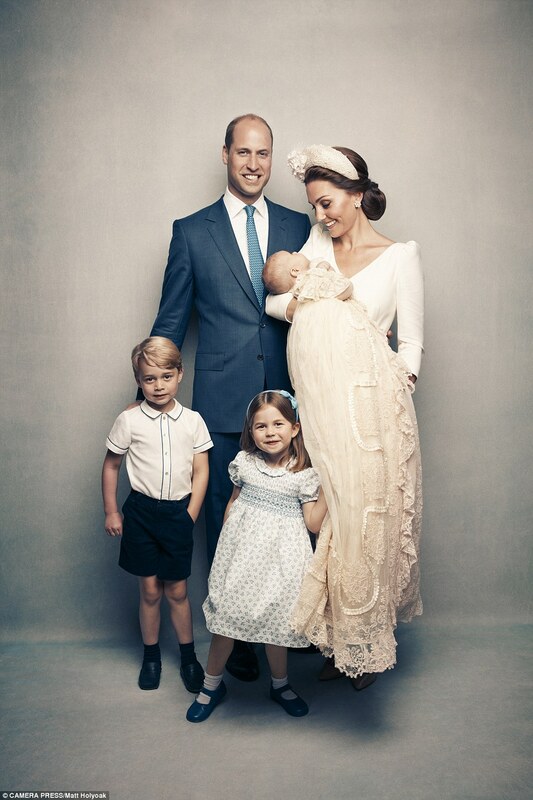 While Louis sleeps on his mother’s lap as Prince George, Prince William and Princess Charlotte sit alongside, the eye is immediately drawn to Kate’s mother, Carole Middleton. The 63-year-old has been positioned behind the children and wears a £1,250 powder blue silk crepe 1940s-inspired dress from Suzannah, with a matching hat. She stands proudly behind her daughter with her husband Michael, 69, to her left. Kate’s sister Pippa, 34, now Mrs Matthews and expecting her own child, also stands behind the Chippendale sofa in a custom-made Alessandra Rich outfit that complements her mother’s. Her husband, multi-millionaire hedge fund manager James, whom she married last year, makes the family group, along with her bearded brother, also called James. The other half of the line-up includes the new Duchess of Sussex, the first time she has joined her husband’s family for such an intimate portrait since her wedding to Prince Harry in May. 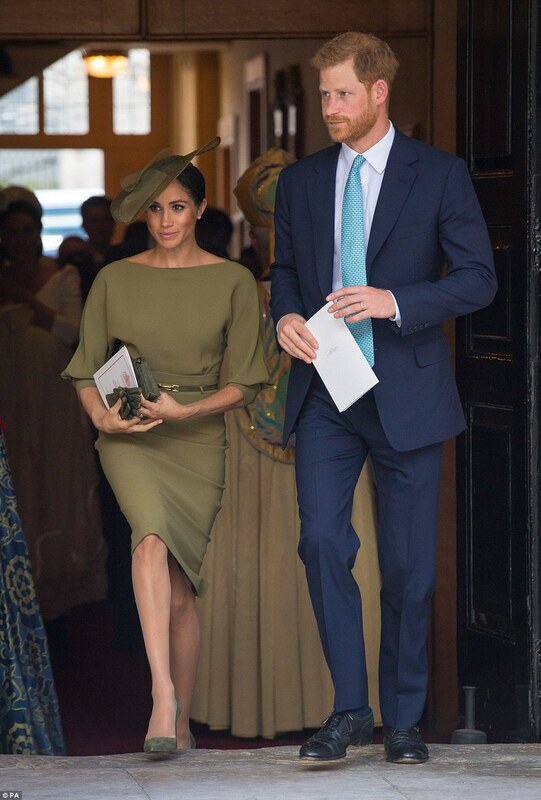 Meghan, 36, in an olive green Ralph Lauren outfit with a hat by Stephen Jones, stands next to a slightly serious-looking Harry. The Duchess of Cornwall is cheerful in a cream Fiona Clare dress and a Locke hat, while grandfather Prince Charles appears tanned and relaxed. On the sofa, William has a protective arm around George – who will be five next Sunday – while cheeky Charlotte stares challengingly at the camera as if plotting her next piece of mischief. Two more images have also been released, seen on the next pages. One shows only members of the royal family, with Charlotte holding her baby brother’s tiny hand. George is by now sitting on his father’s lap and grinning happily at the camera, presumably at some behind-the-scenes antics. The final image shows only the Cambridges, with Charlotte apparently playing peek-a-boo from underneath Louis’s christening gown as Kate gazes at her baby son and a beaming William placing a comforting hand on a slightly hesitant George.